"What's this? Construction project paperwork is not only tedious, it's financially wasteful, and should be stopped? Quick, grab the confetti and turn up the music!" Paper Is PriceyPaper is one of mankind's greatest inventions, but its acquisition is not cheap, either environmentally or financially. What we think of as "office paper" comes by the ream, and those reams aren't cheap. Prices vary depending on paper quality, but reams generally run between $8-$16. 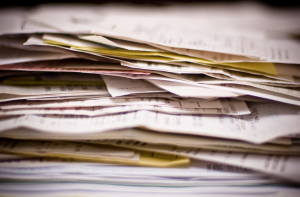 The average office goes through about twenty reams of paper a year, per person. Assuming that your staff of twenty is using the cheapest paper, that still adds up to an annual paper cost of $3,200. "Old School" Paperwork Makes More WorkOne of the reasons that paperwork has been so disliked is that it often has to be done again and again. Because of the lack of a field office at many sites, reports often start out as scribbled notes, which have to be rewritten when the reporter returns to the office. And if those notes aren't transcribed properly, they have to be rewritten. Again. And aside from reports, many other forms of paperwork, like drawings and RFIs have to be copied over to various paper formats repeatedly. Studies have shown that construction companies spend billions of dollars annually both on this copying process and correcting errors made while doing so. Reduce LitigationMillion dollar construction litigation suits have increased by twenty percent over the last decade. Given the amount of paperwork related to such cases, digital paperwork can save considerable money in terms of transmittal and storage. And given that many suits happen over misunderstandings and poor communication, using paperwork software packages to create complete, readable reports might actually help to reduce the number of these suits themselves. There are many construction software benefits with the use of our Raken app!